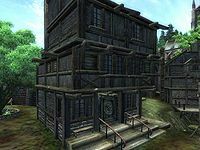 The Lonely Suitor Lodge is an inn located in the southern half of Bravil. It is found across the street from The Archer's Paradox. The proprietor, Bogrum Gro-Galash, buys food and potions while only selling the latter. The ground floor contains the main reception area and bar while the rooms are upstairs. The room that you rent is on the third floor and contains a chest of drawers, a locked chest, and two lower-class single beds, both of which you are free to sleep in. The second floor consists of Bogrum's private quarters, as is usual with Bravil houses and stores, and a second room. The private quarters consist of an owned, single bed and a working table with some pieces of cloth; the other room, which is locked, is quite small and also contains an owned single bed. Alval Uvani, the traveling merchant you will have to assassinate in the A Matter of Honor quest, can be found here on Morndas and Tirdas. Ranaline, a High Elf with a secret, is the cook here, although the inn doesn't have a kitchen. Another regular, Kurdan gro-Dragol, can be found here for the Caught in the Hunt quest. Thieves Guild doyen S'Krivva can often be found here when not in her house. Yet another regular, the Thieves Guild fence Luciana Galena can be found eating and conducting business here every night. A handbill advertising the inn is listed in the Construction Set, but cannot be found in-game. It would have read: "The Lonely Suitor Lodge is ideal for all Bachelors and Bachelorettes. Our rooms are private and soundproof. Our staff asks no questions and tells no tales. Reasonable rates for food and lodging." Abhuki from Faregyl Inn owns the rentable room here. This has no effect on gameplay, since ownership is reset after you first rent a room here, and was done so that the publican Bogrum Gro-Galash won't trespass there. Esta página foi modificada pela última vez à(s) 16h24min de 9 de agosto de 2013.